There are now two aggregators contracting with producers/landowners in Kansas for carbon credits to be sold through the Chicago Climate Exchange (CCX) in its carbon credit pilot project. An aggregator is an entity that accumulates and manages carbon credits. The aggregator acts as a “middleman” between the many producers who generate carbon credits on their land and the ultimate buyer or market exchange. Both of these aggregators are using similar contract provisions, and do not require any payments be made by producers to enter the program. The aggregator in these programs retains 10 percent of the selling price for its administrative fee. The IFB has been involved in the CCX project since 2004. The NFU’s involvement began this year. Other aggregators may join in the future, especially if the program becomes permanent after the pilot project has ended. In addition, there is another carbon credit program being marketed primarily to rangeland managers in Kansas. This program requires a one-time upfront payment, along with an annual fee. The marketing mechanism is not specified. In the CCX program, producers or landowners sign a contract with either the IFB or NFU to sell carbon credits for them on the US carbon market exchange. In the eastern half of Kansas, the acreage eligible for this program includes no-till, strip-till, ridge-till, and new grass plantings made on or after Jan. 1, 1999. 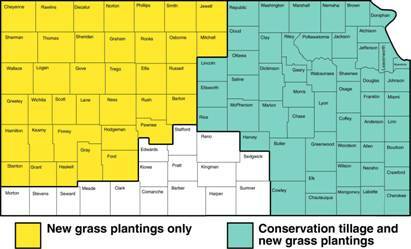 In the western half of Kansas, only new grass plantings are eligible. The map below shows how the state is divided for purposes of this program. There are some requirements made of those who sign these contracts. Producers and landowners who enter into a contract must keep the land in no-till, strip-till, ridge-till, or new grass plantings continuously from 2006-2010. A local entity will verify compliance. On the cropland acreage, soybeans cannot be planted more than three of the five years in the contract period. * No-till/Strip-till: Managing the amount, orientation, and distribution of crop and other plant residue on the surface year-round while growing crops in narrow slots or tilled or residue-free strips in soil previously untilled by full-width inversion implements. *Ridge-till: Managing the amount, orientation, and distribution of crop and other plant residue on the surface year-round while growing crops on pre-formed ridges alternated with furrows protected by crop residue. Carbon credits in the program are issued at the rate of 0.5 metric tons CO2 equivalent per acre per year for those who commit to continuous conservation tillage (no-till, strip-till, or ridge-till) from 2006 to 2010. Carbon credits are issued at the rate of 0.75 metric tons CO2 equivalent per acre per year for new grass plantings. The aggregator will sell the aggregated carbon credits on the CCX board at a time of its choosing. The exact amount received depends on market conditions at the time of the sale. Current market prices are about $3.80-4.00 per ton of CO2. This means a cropland payment could be around $1.90-2.00 per acre. Prices can go up or down on a daily basis. Carbon offset prices on the CCX board can be checked daily on the CCX website: http://www.chicagoclimateeschange.com. The contract is between the aggregator and the person who signs the contract, either the landowner or the operator. The party that signs the contract is the one responsible for fulfilling the contract. Whoever has functional control of the land and makes day-to-day decisions on the farm should sign the contract. The Carbon Disclosure Project (CDP) represents a potentially significant new trend in the climate change discussion in the U.S. and the world. CDP is a coalition of some of the largest global investment firms, together managing more than $31.5 trillion in assets. These large institutional investors are concerned about the potential future impact of climate change on the companies in which they invest. The investors are trying to determine where the largest national and global companies currently stand on greenhouse gas emissions, what costs they may incur in the future because of this, and whether the companies have any plans in place to reduce those emissions. To the investors in the CDP, climate change is a very significant financial concern. Their concern may help move business toward climate change actions. This pressure, together with action by individual states such as California and the coalition of New England states, may eventually encourage more stringent greenhouse gas emission reductions in the U.S., despite a lack of action on the national level. The Earth has been warming at a rate of 0.2 degrees Centigrade (0.36 degrees Fahrenheit) per decade for the last 30 years, according to the research team led by James Hansen of NASA's Goddard Institute for Space Studies in New York. “Global surface temperature has increased about 0.2°C per decade in the past 30 years, similar to the warming rate predicted in the 1980s in initial global climate model simulations with transient greenhouse gas changes. Comparison of measured sea surface temperatures in the Western Pacific with paleoclimate data suggests that this critical ocean region, and probably the planet as a whole, is approximately as warm now as at the Holocene maximum and within about 1°C of the maximum temperature of the past million years. The Holocene is the most recent 10,000-year period, since the end of the last ice age on Earth. Water changes temperature more slowly than land because of its great capacity to hold heat, but the researchers noted that the warming has been marked in the Indian and western Pacific Oceans. Those oceans have a major effect on climate and warming that could lead to more El Niño episodes affecting the weather.